Sushmita bought her Miss Universe finale evening gown in…. 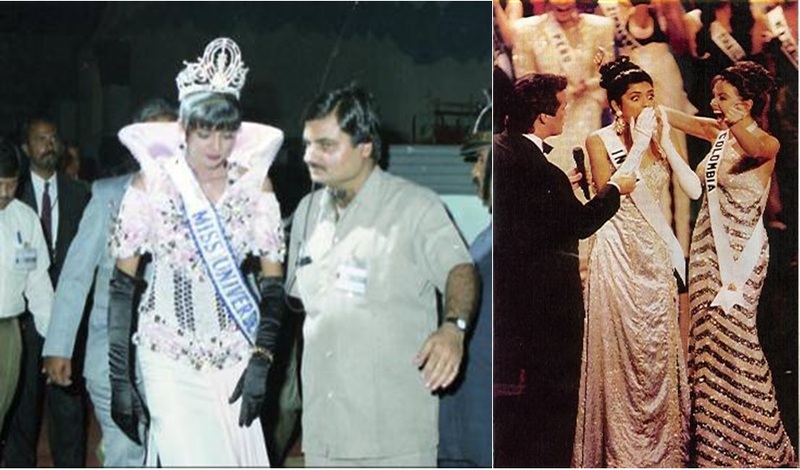 Sushmita Sen a white gown in preliminary round of Miss Universe 1994. However, it didn’t look as flattering and didn’t fetch much good reviews. Although, Sushmita pulled it off quite well, she was not sure of continuing the same gown in finale. So she went out to look for some local designer in Philippines and got the golden gown. It is notable that in the given pic, although Sush looks better in white here, the same gown got her 9.14, at 6th position, in preliminary round whereas the golden gown got her 9.792 score with 3rd position. She also borrowed the matching earrings from the representative of Host country Philippines. Note: The pic in white gown was taken after her win at Miss Universe but she wore the same gown in preliminary. The gown that she wore in the finale was not a golden colored gown but a silver one. It was designed by Indian designer name Sangeeta Chopra. The same designer who had designed gowns for Madhu Sapre (1992) and Namrata Shirodkar (1993). it’s not gold! the gown she wore during the finals was SILVER GOWN. I WAS THERE IN 1994 IN PICC, PATRON 3RD ROW.IR’S SILVER.